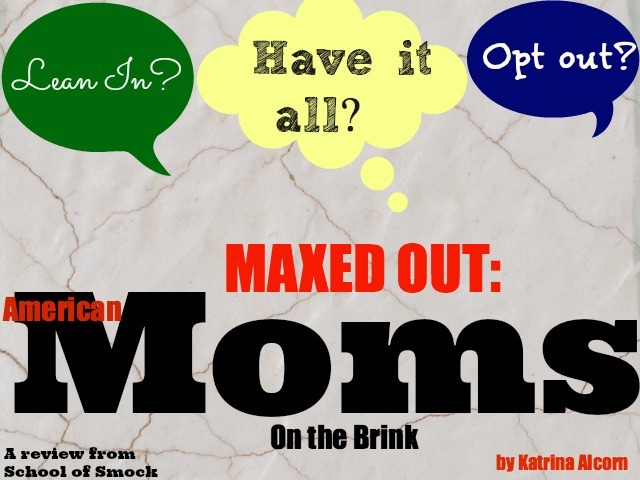 I’m thrilled that we’re discussing Maxed Out: American Moms on the Brink by Katrina Alcorn this month for our Brilliant Book Club. It’s a personal story of how juggling the demands of work and parenting caused Katrina to “max out” and break down emotionally. She connects her own experiences as a working mom with her thoughts about the changes that we need to make as a society to make working mothers happier, healthier as well as better parents and workers. Like Lauren Apfel, who writes in her post about the book that she doesn’t feel stretched to her breaking point, I’m not “maxed out” right now. Sometimes I’m stressed out. Sometimes I feel overwhelmed by the demands of a toddler. Sometimes you might find me in tears after an hour-long attempt to put an overtired and screaming little boy down for a nap. Sometimes I look at our current financial situation and panic, realizing that our (mostly) one-income family situation is completely unsustainable for the long-term. Sometimes I walk past the bookcase of academic books (now unused) and piles of research papers in my “study” — the hundreds of books and articles that I used to write my dissertation over the course of several years — and I feel like I’m cheating myself, not using my training and talents to achieve more, to live up to the expectations of others (and myself) for my continued success. Yet here’s my truth: I live in fear of becoming a maxed out mom. Now this is where I thought the book would start to annoy me. I hate cautionary tales of fragile women not being able to hack it in the work world, only to retreat back to the home. I know every woman’s personal story is different, but too often these stories seem to be implying that women are better off not even trying to juggle work and family. And they seem to be about blaming the woman, rather than confronting the deep structural gaps — in maternity leave, in sick leave, in workplace culture — that make parents’ lives — women and men — so difficult. Women’s experiences are reduced only to “personal” choices, stripped of any cultural or institutional factors that significantly impact their lives. The discussion then becomes about why this individual woman can’t cope with her life, seeming to blame her, rather than asking bigger questions about our society, our government policies, and our workplaces. Ultimately, this book is about change: how we as women and as parents need to confront this incompatibility between work and home life. And confront this challenge together. Change needs to happen at every level, from the home to workplace culture to government policies. 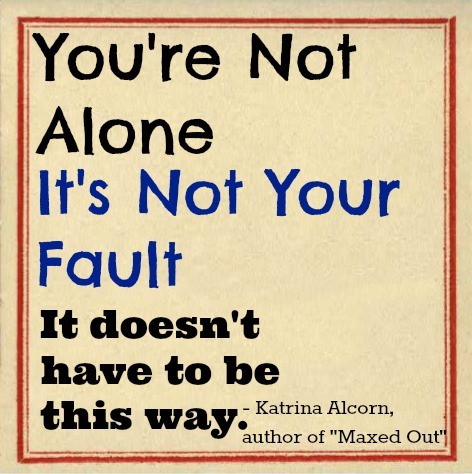 Here’s the message that I took away from the book: you are not alone. If you feel “maxed out” and “on the brink” of losing something — losing your mind, losing your job, losing your mental and physical health — stop personalizing it and take action. And not only are you not alone and not crazy, but there are understandable reasons for that stress. And now, months later, as I reflect upon the book again, I have realized something deeper about myself: I am more terrified of being “maxed out” than I am of the what-ifs (what if I could have become a tenured professor? what if I had turned my dissertation into a book?). I am more scared of being a maxed out mom than I am of my current inability to provide greater financial security for our family. I am more scared of a life in which I am only “keeping it together with prayers and duct tape,” as Alcorn describes the lives that many working women face. I am making sacrifices — my own career advancement, my family’s savings — because I know I couldn’t do it all. Actually, I couldn’t do half of whatever “having it all” entails. I’m trying to cobble together my own writing career path for me. This is the truth: I am not a (mostly) stay-at-home for the sake of my son, or my husband. My son loves preschool, and I know he would be happy with full-day day care as well. I’m doing this for me, my own mental well-being and happiness, based on hard-won knowledge of my own temperament as a writer and an introvert. I’ve become an obsessive fan of the political thriller TV show “Scandal,” which features Kerry Washington as a Washington “fixer” of scandals named Olivia Pope. She and her team are so dedicated to their clients and to their firm that they call themselves “gladiators.” They’re passionate, obsessive, driven, willing to sacrifice their lives to Olivia’s causes. They pursue success at all costs, to themselves or to others. I’m not a gladiator. I’m not even a part-time, mediocre gladiator who takes lots of naps. Right now I’m okay with that. Maybe in five years I’ll try to be a gladiator, or maybe I’ll never be one. But here’s the thing: I hate the fact that other women find it difficult to be gladiators for their jobs (or modified parent-gladiators) as well as happy mothers. I already have excellent child care, a very supportive husband, and the potential to have a career with flexibility (university teaching or research). But that’s still not enough to enable me to be a gladiator. I’m not built that way. But I want lots of women to be able to be career-focused gladiators. For other women, the lack of those structural conditions — not enough sick time, not enough maternity leave, lack of quality child care, an unsupportive spouse (or lack of spouse in the first place) — makes the difference between finding and keeping a fulfilling, well-paying job and being able to support their families without losing their minds. For these women, because of differences in financial circumstances or personalities, they want to be gladiators at their jobs, but there are so many ways that their lives are harder than they should ever be. They’re ambitious, goal-directed, and willing to juggle the competing demands of parenthood and work. And here is why I loved this book: because of its emphasis on action. Because it says to women, those who are striving to be breadwinners, productive employees, and even leaders in their fields, that there are millions of other women like you. It’s not your fault that structural conditions are this way, that modern parenthood is increasingly demanding, that we live in a society that is individualistic rather than supportive to working parents. And the book also demonstrates that there is the possibility for change, if we as women — no matter what our choices or current situations — fight for it. Have you picked up your copy of The HerStories Project: Women Explore the Joy, Pain, and Power of Female Friendship ? All four of us — Lauren, Stephanie, Deb, Sarah, and I — are contributors! Thankful For “Having It All”? I agree with Deb: I relate to this post intensely. And the fact that you included Olivia Pope in it, well, that just makes me love you all the more. Let me add these lines as favorites: ‘I am making sacrifices — my own career advancement, my family’s savings — because I know I couldn’t do it all. Actually, I couldn’t do half of whatever “having it all” entails…I’m doing this for me, my own mental well-being and happiness, based on hard-won knowledge of my own temperament as a writer and an introvert.’ Self-awareness is such a gift and it never ceases to amaze me how many ‘problems’ it solves. I know women/mother gladiators out there, for whom I have huge respect, and I too want the workplace to be better and more accommodating for them. But I am not sure what changes in this regard will help keep them sane more than an ability to make choices in light of a true understanding of the reality of balancing *their* version of career with *their* version of motherhood. Yes to self-awareness and to Olivia Pope! I love how we agree on so many aspects of the book, but take different perspectives on others. And you have contributed so much, Lauren, to my current obsession with Scandal. But seriously isn’t she such a fascinating entertainment figure? I enjoyed this book quite a bit. I was skeptical at first like you, Jessica. But I liked how Alcorn weaved research and social critique as a way of understanding herself and many other women’s situations. This just might be how I go about understanding myself. I think Alcorn shows a deep self-awareness as well. While I am not “maxed out” at this moment, I certainly have been. I will never forget taking an RV trip with my husband and 2 month old daughter in August of 2007. I looked at her and questioned the whole purpose of my life. It was time to face the fact I was a workaholic– a teacher and supervisor of 47 h.s English teachers in a large urban school district. For her first year of life, my child was in daycare from 6:30am to 4:00pm (give or take an hour depending on the day’s events) with so many complications to juggling everything. I love being an educator and supporting students and teachers. It gives me so much joy, but I had to face the fact I could not share these two jobs. So, I moved on and entered a doctorate program–it was a little more flexible (I know I’m a weirdo!) As you can see, I am incapable of “opting out.” It is just not how I am wired, but I do not think I am capable of “out of the home” full-time work. I need flexibility so that I can manage my stress (constantly a work in progress) and be emotionally and physically present for my children. Fortunately, I have this luxury due to my husband’s job (the downside is it requires him to work long hours). I find myself teetering on feeling like I am not doing enough because I am not “maxed out” and being content in my fragile, yet stable, balancing act. I am still facing my unrealistic vision of “success.” I also worry about not being self-sufficient should I ever need to be. Ugh! I am feeling anxious now–need to bet back to the dissertation before I have to pick kids up from school. I am sooo looking forward to reading this book! I bought it, now need to take the time to read it. I feel pretty maxed out. But I do feel like a gladiator. (I’m also very self confident! LOL) Sometimes too much of a gladiator I suppose. Alexa recently posted…Does Google Know it’s my Birthday? I’d love to hear the perspective of a gladiator after you read this book! Definitely let us know what you think! I will admit, I was quite scared of this book. But this is such a beautiful post, and such an open, honest reaction, that it makes me want to grab it. I loved this post, Jessica, and I love how you so honestly and openly made the contrast between what you want for yourself, and what you want for women in general. I seem to walk a very fine between my fear of burning out and my desire to advance my writing career (not to mention continue working at my actual paid job- the one that brings the income my family actually needs.) This was such a beautiful glimpse into your personality and choices. Stephanie @ Mommy, for Real. recently posted…Can You Be “Maxed Out” If Your Boss is YOU? Jessica, I love your take on this. Because it is about what we need for ourselves – whether it’s the career or being at home. And having the social structure and resources in place that allow us a full range of options for family and work life, that include the needs of women and men and children. And YES on taking action. That’s something I need to get better at. I know. Me too. I used to be a huge political junkie — listening to the news, engaged in politics online, helping to contribute to campaigns, organizing lessons about elections and civics for our school. That part of my life has been put on the back burner for now, but I really want to become more active! Okay, now I can’t wait to pick up this book. I hate that the structural inadequacies in our system that don’t allow women to make the choices that they’d otherwise make. I don’t think we’re fragile so much as pulled in 15 different directions at once. That’s tough. I haven’t read the book, but I adore this post. So much. I applaud you for realizing that you are not a gladiator, and don’t want to be. I went back to work part time, because I thought it would be easy. It’s not, and I find myself saying much too often “I can’t do all of this, anymore.” Now, I’m working on listening to myself to figure out where I need to let go. Thanks for a great post.